A 34-year-old rural woman presented with a 2-month history of weakness, fatigue, anemia, and thrombocytopenia. Acute myeloid leukemia (AML-Non M3) was diagnosed through peripheral blood smear and bone marrow biopsy-aspiration. Chemotherapy was administered with 7 days of standard-dose cytarabine and 3 days of daunorubicin. On the 18th day of chemotherapy, while patient was taking fluconazole (400 mg/day) as prophylaxis, we detected fever (38.5°C) and severe neutropenia (ANC < 100). Antibiotic regimen with imipenem and vancomycin was started and sepsis workup was done. After 72 h, the woman's condition worsened. The results of primary sepsis workup were negative. The patient became dyspneic in addition to the fever. Physical reexamination revealed a necrotic black scar on the nasal septum and tachypnea (respiratory rate: 33/min). Amphotericin B was prescribed and the following investigations were ordered. 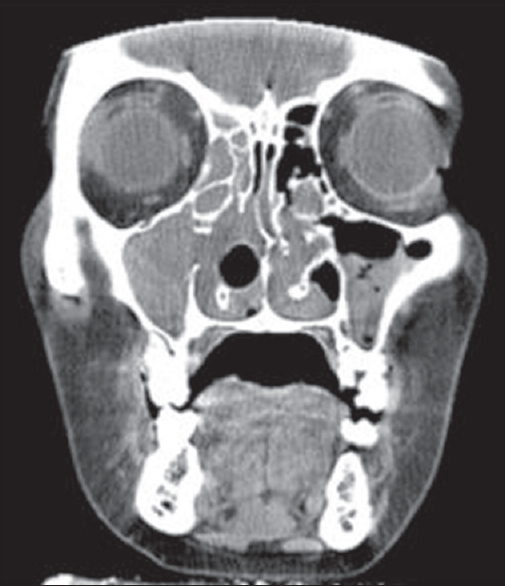 The CT scan revealed pan sinusitis with bone destruction [Figure 1]. There were necrosis and black scar in sinusoscopy; so surgical debridement and tissue biopsy were done. Serum galactomannan was 2.5 and histopathology revealed septated narrow angles hyphae [Figure 2] and Aspergillus grew on tissue culture. After beginning of amphotericin B and surgical debridement, symptoms abated. Amphotericin B was changed to voriconazole, and despite profound neutropenia, fever and other complaints disappeared. Galactomannan level decreased to 1.1 after 2 weeks. One month later, when she was being scheduled for the next chemotherapy cycle, another episode of fever was detected, with epistaxis and a dry cough. Amphotericin B was added to voriconazole and investigations were repeated. 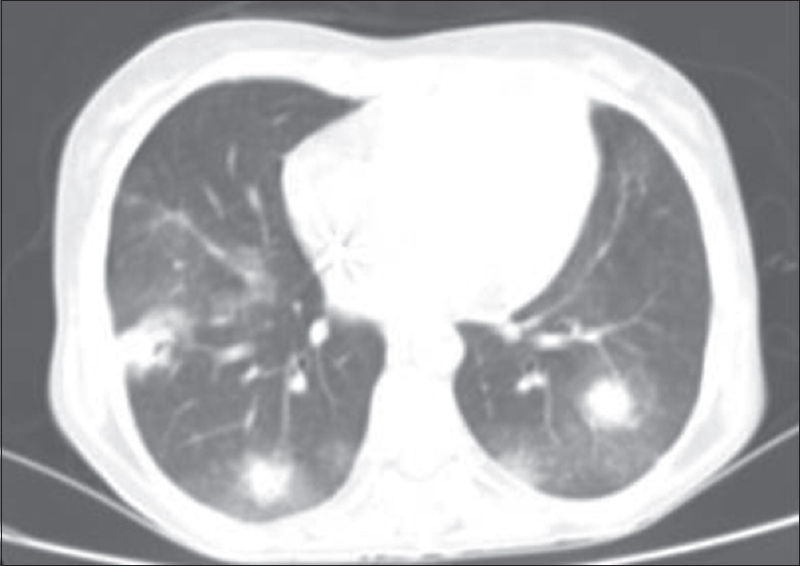 On a second CT scan, we detected new lesions in the PNS and multiple bilateral nodules with halo sign in both fields of her lungs [Figure 3]. 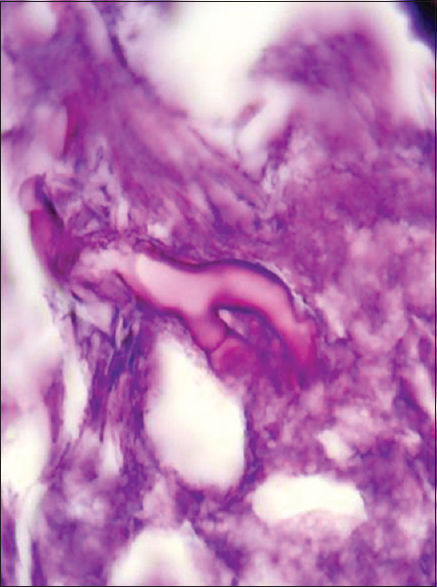 Culture and histopathology of sinus biopsy revealed mucormycosis [Figure 4]. Antifungal combination therapy continued until 6 weeks. The complaints resolved and several sinusoscopy results were negative for fungal infections. Sometimes, coinfection or consecutive infections with opportunistic microorganisms are detected in severe immunodeficient patients. These infections can be caused by fungal, mycobacterial, and even parasitic agents.,,,, Coinfection or consecutive infections of invasive aspergillosis and mucormycosis have been usually reported in hematologic malignancy patients with severe neutropenia. For example, in a patient with chronic lymphocytic leukemia treated with alemtuzumab reported by Henn and coworkers, there were three consecutive fungal infections (first cryptococcosis, and when the patient was taking amphotericin B and flucytosine, aspergillosis and mucormycosis were detected). In another report, an AML patient was infected with aspergillosis and mucormycosis during chemotherapy, took liposomal Amphotericin B, and was discharged after remission. In addition, a case of Castleman's disease under chemotherapy developed aspergillosis and mucormycosis sinusitis and was cured after early surgical and medical treatment. Faster growth of mucorales compared to the Aspergillus family is an important point that emphasizes the need for earlier diagnosis and quicker treatment of mucormycosis compared with aspergillosis for preventing bad outcomes in mucormycosis cases. Early implementation of empiric antifungal treatment is the standard approach to manage hematologic malignancy patients with suspected fungal infections, especially in the neutropenic phase after chemotherapy. Voriconazole is the treatment of choice for patients with invasive aspergillosis but is not effective against mucorales. Different types of amphotericin B are effective against Mucorales, Aspergillus, and Candida. As mentioned, differentiation between these three fungal infections is very important because the drug of choice is different. It seems now that there is only one drug for intravenous induction treatment of aspergillosis and mucormycosis coinfection and it is amphotericin B. But there is no accurate information about the duration and dosage of treatment in these cases. Posaconazole is only oral secure medication for treating aspergillosis–mucormycosis coinfection. In conclusion, in immunodeficient people, especially patients with hematologic malignancies with deep neutropenia, signs and symptoms of refractory infection or relapse of invasive fungal infections should prompt the clinicians to consider coinfection or consecutive fungal infections with two different types of molds. Vaidya D, Shah P. Coinfection by Aspergillus and zygomycetes species in a case of acute rhinosinusitis. Case Rep Otolaryngol 2011;2011. doi: 10.1155/2011/382473. Bergantim R, Elisabete R, Fernanda T, Guimarães JE. Invasive coinfection with Aspergillus and Mucor in a patient with acute myeloid leukemia. Clin Drug Investig 2013;33:S51-5. Warpe BM. 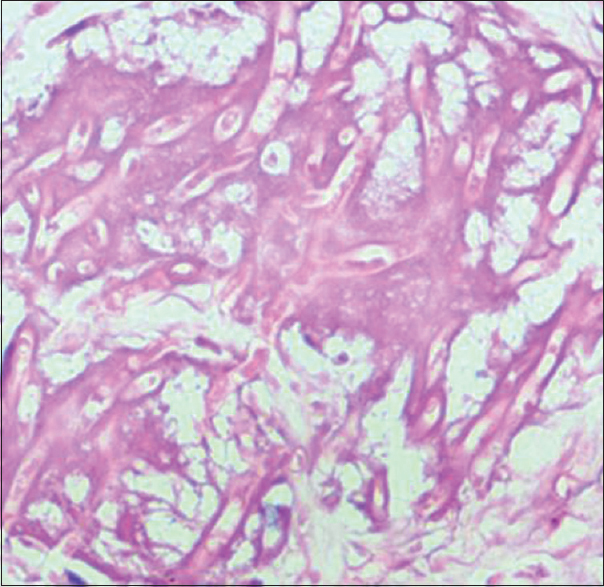 Pulmonary aspergillosis and mucormycosis in an Immunocompetent type 1 diabetic patient with past history of healed tuberculosis. J Diabetol 2015;2:4. Rit K, Saha R, Dey R, Barik G. Rhino-oculo-cerebral Aspergillus and Mucor coinfections in an immunocompromised patient with type 2 diabetes mellitus. Med J DY Patil Univ 2014;7:486-8. Mahadevaiah AH, Rajagopalan N, Patil M, Shivaprasad C. Coinfection of pulmonary mucormycosis and aspergillosis presenting as bilateral vocal cord palsy. BMJ Case Rep 2013;2013. doi: 10.1136/bcr-2013-009615. Maiorano E, Favia G, Capodiferro S, Montagna MT, Lo Muzio L. Combined mucormycosis and aspergillosis of the oro-sinonasal region in a patient affected by Castleman disease. Virchows Arch 2005;446:28-33. Aggarwal D, Chander J, Janmeja A, Katyal R. Pulmonary tuberculosis and mucormycosis co-infection in a diabetic patient. Lung India 2015;32:53-5. Guo J, Sun Y, Man Y, Huang X, Qin Q, Zhou D, et al. Coinfection of Strongyloides stercoralis and Aspergillus found in bronchoalveolar lavage fluid from a patient with stubborn pulmonary symptoms. J Thorac Dis 2015;7:E43-6. Henn A, Mellon G, Henry B, Roos-Weil D, Jauréguiberry S, Mordant P, et al. Disseminated cryptococcosis, invasive aspergillosis, and mucormycosis in a patient treated with alemtuzumab for chronic lymphocytic leukaemia. Scand J Infect Dis 2014;46:231-4. Lewis RE, Lortholary R, Spellberg B, Roilides E, Kontoyiannis DP, Walsh TJ. How does antifungal pharmacology differ for mucormycosis versus aspergillosis. Clin Infect Dis 2012;54:67-72.